The newest addition to the Las Vegas hotel scene is the M Resort Casino Spa, a modernistic, drop dead gorgeous oasis palace of hip pleasure with spacious expanses of marble, structured amber glass and lofty ceilings. First thoughts are why such a trendy palace so far from the Strip? But on second thought, the M lies at the gateway to Las Vegas when traveling on the 15 from California, just off the interstate at the intersection of St Rose Parkway and Las Vegas Blvd South. It’s also a short drive from Henderson and Anthem – an area recently one of the city’s fastest growing, and sure to be again when the recession ebbs and home sales and building re-commence. The Marnell family, successful in the actual construction of casinos for others, has learned well from its experience. The architecture is monumental, the style forward, luxurious but youthful and hip. It should please anyone, although was definitely intended to attract a more urbane, under 50 crowd. Citing lack of funds, Anthony Marnell III explained to the Las Vegas Sun that although he knew building a more environmentally smart structure was what he should have done, he declined the Lied formula based on costs. Who am I to argue with a wildly successful businessman, but one can’t help but wonder if that decision was short-sighted. It seems to be one that many builders take here in the Valley, ignoring the harsh reality of looming energy and water crises. Highlights of the M include a movie set pool area with a surrounding marble campus reminiscent of grand Egyptian temples – plenty of space here for any reception or grand ball. They did a reasonable job on the sweeping canopy of the hotel entrance, but the M lacks a grand entrance which says "Here I am and here is exactly how you get to me." Anyone with a sprinkling of feng shui expertise would have spotted that right away. It’s not that hard to take the wrong turn and end up in the outdoor parking area. They also need to do something about the valet pick-up. Totally exposed to the elements (wind and sun), someone forgot that many clients use the valet services to avoid the elements. The lobby has splendid wow power with walls of elegant fresh lilies complemented by soothing cascading water elements. It’s a pleasure to access restaurants and guest elevators without the obligatory pass through the casino area that haunts most Strip venues. The Baby Cakes pastry and gelato shop serves exquisite sweets for great prices. A large scoop of gelato in a delicious cone is $2.25 and worth every penny. You can get two scoops for $3! The pistachio gelato was divine. The gelato selection is limited, but certainly adequate for anyone, and I would place their flavor and quality on par with the Bellagio. Don’t miss the croissants! The Hostile Grape wine cellar on the lowest level is worth the drive alone. With an amazing array of both good sipping wine and higher end vintages, you can either select your own from the myriad of dispensers or be served at the small bar. Furnished with intimate clusters of low Italian leather sofa sets or high bar stools grouped around tall modernistic cubes, the low lighting and soft music make it the perfect spot to gather, partake and socialize in intimacy. You take a glass and and using pre-paid tasting cards, select your own wine, 1,3 or 5 oz, from a selection of 160 – and enjoy. Access to the Grape is by stairs leading down from the lobby or a glass elevator. I revised my opinion of the 32º Draft beer bar in another post, and was grossly unfair when I panned it for it’s proximity to the slot machines and sports betting. When you are savoring those incredibly priced ($3.50 domestic, $4.50 imported) and ice cold beers, you forget all else. We ate at the Tower Restaurant, Veloce Cibo, which did not disappoint in terms of spectacular view of the valley. The menu was diverse which surely pleases in the way the variety of a buffet will satisfy the palettes of groups with varying tastes. Much of it is designed to share, adding to the buffet-like advantage – while still being served at table. Unfortunately, several of the dishes fell short – most notably the sushi which is their flagship. If you can’t make a California roll, you are in trouble. I cannot recommend it at all. The tuna sashimi, au contraire, was fresh and delicious. The fried calamari were not light enough, the batter being a little "floury" and lacking delicacy. The chicken wraps were tasty and well spiced, with excellent lettuce (not iceberg), but not served with the crispy raw veggies that give them crunch and freshness. The Asian marinated steak was superb and, by far, the best dish of the evening. Although the staff tried very hard, there was something generally chaotic about the service and I kept thinking that much more training was needed. The prices are not for budget-minded. I am hard pressed to give Veloce Cibo a high recommendation for fine dining. The Guest rooms do not disappoint and the selection of suites, especially the 2 story 2400 sqft loft suites with wrap around views of the Valley, are sufficiently extravagant to impress most visitors. Keeping with trends, all rooms offer IPod docking and room safes large enough to accommodate laptops. Geared to a younger set, the dress code is casual chic. Designer jeans and tight T shirts, accented by some Vegas Bling and you are in mode. 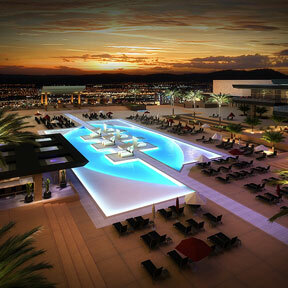 Visit for architectural experience – don’t miss the pool. Don’t miss Hostile Grape if you are wine lover. Good post! I will recommend your blog to some friends, nice work!